Stylish and economical, the J01 Java Wall Station is the perfect selection for many salons. Features wide work surface, two full-extension drawers, and 5" wide angled tool panel w/ holders for blow dryer and two curling irons. 29"W x 15"D x 7"H plus 5" wide tool panel. Easily mounts to wall with screw cleat using fasteners that are wall-appropriate. 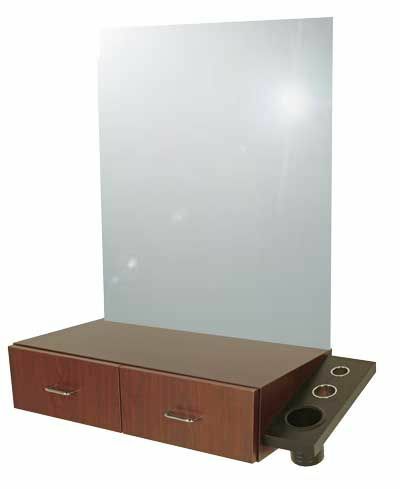 Mirror of choice by customer; pictured mirror is not included.